Gotcha. Will do. There are only two thing I've never messed with on a bike, case splitting, and shock rebuilding. 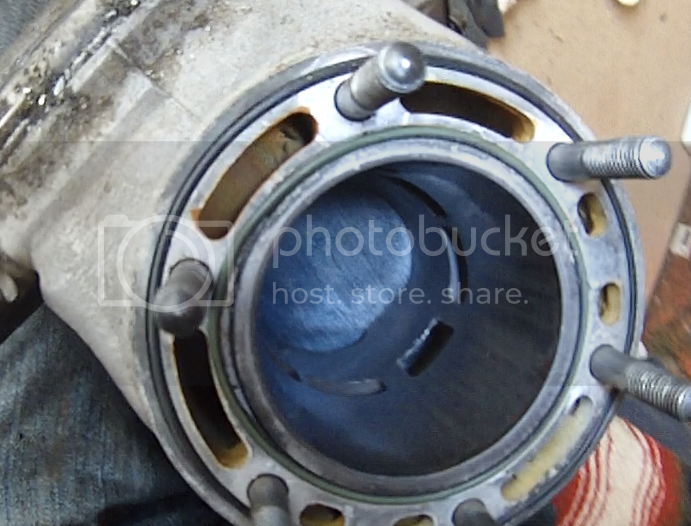 From the looks of that piston it looks like one of the rod bearings fragged. 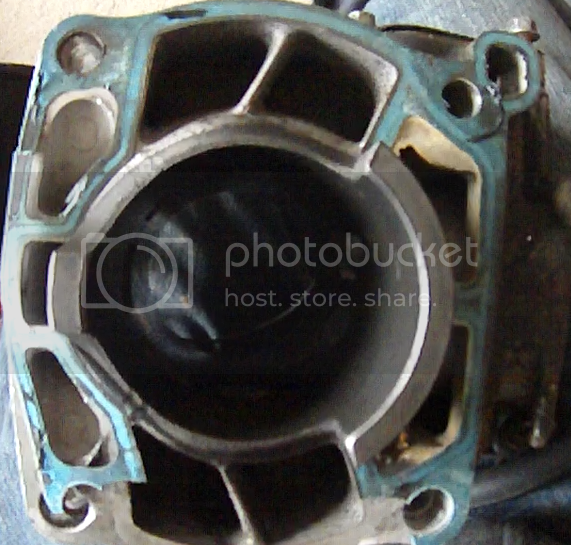 I am really surprised the cylinder doesn't need repaired/replated. I am pretty sure those were plated. Try sticking a magnet to the bore. No stick, plated. Unless someone had it sleeved it previously a 1995 should be plated. I had a 1992 RM125 and it was plated. Also, the PV is all dented, I will be grinding the burrs out and hoping for the best. Looks like a sleeve, take a pic from the bottom. Don't hone it, take it out to the next oversize. Its sleeved. As kiwi says, bore that sucker. Alright, I'll see what I can get my hands on. I'll be buying the big end bearing and splitting the cases as soon as I get the damn SA pivot bolt out. Agreed, the pictures were very helpful. The thickness of the sleeve and if it was bored already will determine how far you can if you want to go bigger. 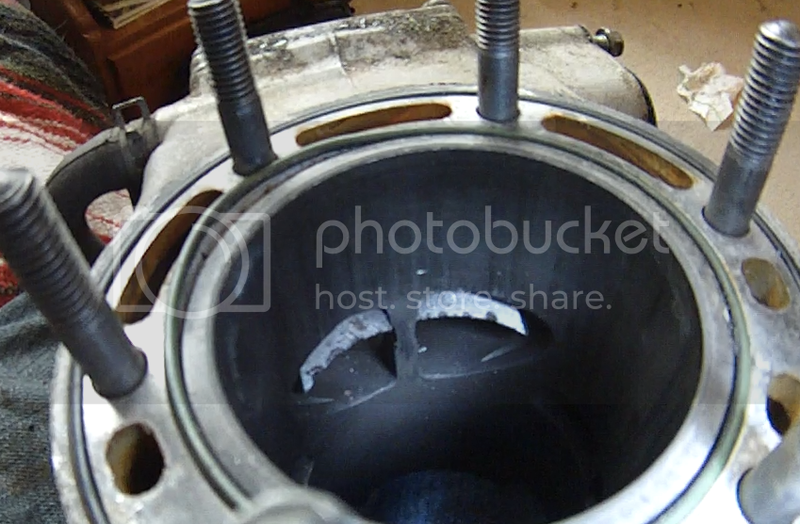 Can you see any markings on the top of the piston or is it in too bad of shape to see? The whole top of the piston is melted, I don't think I'll be getting any info from that sucker hahaha. I've been moving for the past few days and going now I'm going on vacation for a few days. I haven't had time to pound that SA bolt out, but I've been soaking in WD40, so hopefully it'll come out as soon as I get home. It could be plated but the pics(Blurry) are kind of hard to tell. I wouldn't be shocked if it were sleeved, you can get a steel sleeve for practically any bike. After checking a few threads on other forums I guess sometimes other alloys make into the nikasil and a magnets will sometimes slightly stick(1/8 pull or less.) Scrub the top of the piston, you might get lucky. Again sorry for any missinfo (If any), pics can be deceiving. It's all good man, things are hard to determine over pics hahaha. If it has a steel sleeve, but is in fact plated on the sleeve, can I bore it, which would get the plating off, and match a piston and run it with the steel? My patience is running very low with the bolt. It's the ONE thing holding me up from the rest of the project. I literally pounded on it for 10 minutes today with a 3 lb hammer and then upgraded to a 10 lb sledge with no luck. It wont press out. What do I do now? Can I cut it? If so, where with out damaging the frame and swing arm?